It's a sad day for pedantic assholes everywhere, but a happy, happy day for the rest of us. 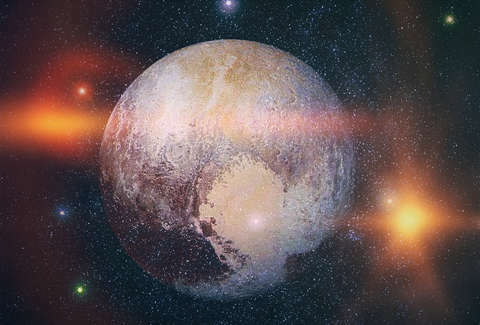 Pluto may soon be considered a planet again. Honestly, things haven't been right ever since the loneliest (dwarf) planet was stripped of its title. Maybe this is the first step to turning this whole timeline around. It's not certain either way right now, so don't start planning your Pluto-themed party yet. An article was published in the scientific journal Icarus arguing that the rationale behind stripping Pluto of its planethood was invalid for reasons that are kind of complicated. In short, the International Astronomical Union changed its guidelines for planethood in 2006, saying the heavenly body must meet three criteria: "(a) is in orbit around the Sun, (b) has sufficient mass for its self-gravity to overcome rigid body forces so that it assumes a hydrostatic equilibrium (nearly round) shape, and (c) has cleared the neighbourhood around its orbit." Pluto, the IAU claimed, didn't meet the third part of that definition because it isn't the largest gravitational force in its orbit. Hence, it was humiliated and called a dwarf planet. This new paper argues that that third criterion should be removed from the definition, which would reinstate Pluto. Philip Metzger, the lead author of the study and a planetary scientist at the University of Central Florida, explained in a UCF statement, "The IAU definition would say that the fundamental object of planetary science, the planet, is supposed to be defined on the basis of a concept that nobody uses in their research." In arriving at this conclusion, Metzger and the paper's other authors combed through over 200 years worth of research and found only a single study from the early 19th century that used that orbit-clearing standard. Metzger thinks a planet should actually be based on whether it's big enough that its gravity allows it to take on a spherical shape. "And that's not just an arbitrary definition," he elaborated. "It turns out this is an important milestone in the evolution of a planetary body, because apparently when it happens, it initiates active geology in the body." The AIU is apparently open to reinstating Pluto and changing its definition of a planet, but no proposal has been submitted yet. Lars Lindberg Christensen, a representative for AIU, said that if a member brought up a motion to the group the change would be debated. Whatever the outcome of that debate, all that really matters is that Pluto never stopped being a planet in our hearts.